I have a work of art I need appraised, how can I have this done? Please review our Authentication Services. I have a work of art I want to sell. Can you help me? Of course we can. The gallery is in the business of buying and selling works of art. Please contact us and we will be happy to discuss your options in more detail. Please note that we will need to see images of the work/works in question and have all the appropriate documentation (size, medium, signature, etc.). Does the gallery sell prints of the 19th century works? No. We only offer the original works of art. If you need information concerning a print, etching, lithograph, etc., please search for a dealer who specializes in them. I have a work of art that needs restoration can you help? Yes. We offer expert advice on conservation and restoration services. Please feel free to call the gallery at (212) 355-5710. 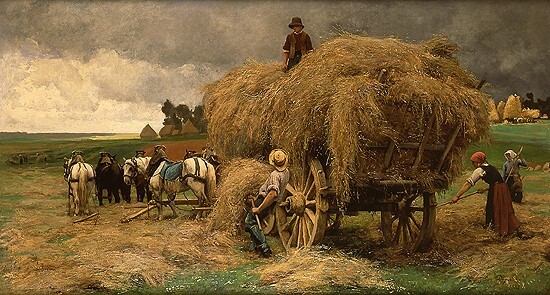 I have the following work - Haying Time - An Approaching Storm. It is a black and white work that measures about 3 x 4 feet and has the following verbiage centered below the picture: "Entered according to Act of Congress in the year 1882 by Fishel Adler & Co. at the office of the librarian of Congress at Washington". Is there any information that you can give me on this work of art, or do you know somewhere that I may obtain some information? What you have is a reproduction of Julien Dupre's 1881 Salon painting - La Récolte des Foins (photo of the original work shown below). This work was widely reproduced and currently has only decorative value. I have an original painting by Julien Dupré and the title is printed at the bottom, how much is it worth? If the title of the work is actually ‘printed’ on the piece then you, more than likely, have a print. These prints, currently, have little more than decorative value. I have a work by Julien Dupré that I need appraised, how can I go about having that done? I have an original painting by Julien Dupré that I want to have authenticated, what do I need to do? 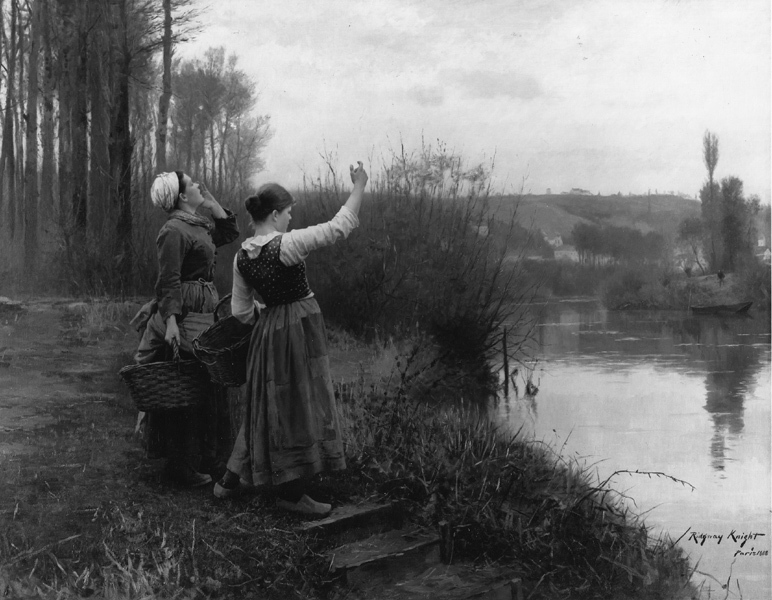 I have a work by Daniel Ridgway Knight titled – Hailing the Ferry (l’Appel au Passeur) – what is it worth? This painting was one of the most reproduced works in the 19th century and Ridgway Knight only painted two known versions of it. The largest, and most famous, is in the collection of The Pennsylvania Academy of the Fine Arts, Philadelphia, PA (image shown). The second is a smaller version and is currently in a private collection. What you, more than likely, own is a reproduction of the work and these works have little more than decorative value today. I have a work by Daniel Ridgway Knight titled – The Gossips – what is it worth? This painting was also widely reproduced in the 19th century and Ridgway Knight only painted one known version of it. As with Hailing the Ferry, this painting is in the collection of The Pennsylvania Academy of the Fine Arts, Philadelphia, PA (image shown). I have an original painting by Daniel Ridgway Knight and the title is printed at the bottom, how much is it worth? 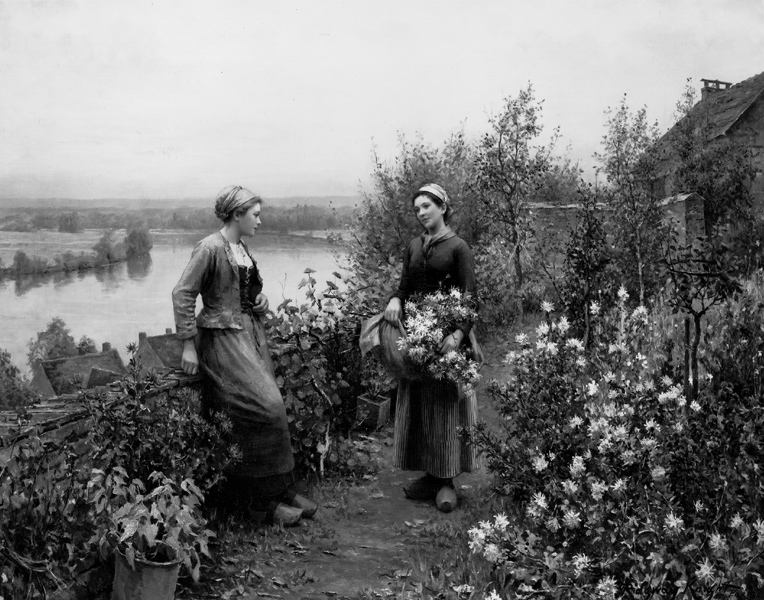 I have a work by Daniel Ridgway Knight that I need appraised, how can I go about having that done? I have an original painting by Daniel Ridgway Knight that I want to have authenticated, what do I need to do?